If you need to fasten a series of bolts or screws all to the same torque this is the driver for you. 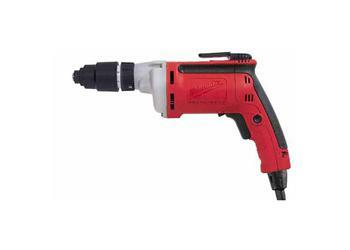 The 6.5 amp 6580-20 has an easily adjustable clutch that can be set for 10 to 140 inch pounds. It also features a 10 ft. 2 wire Quik-Lok® cord, 48-76-5010, for easy storage or field replacement. The belt clip, 22-64-3270, is easily replaced as a service part. Multi Position Torque Sensitive Clutch - 10 - 140 in-lbs. (1) 48-30-2601 - Slotted Power Bit 6-7 x 3-1/2 in. (1) 48-30-2651 - Slotted Power Bit 10-12 x 3-1/2 in.